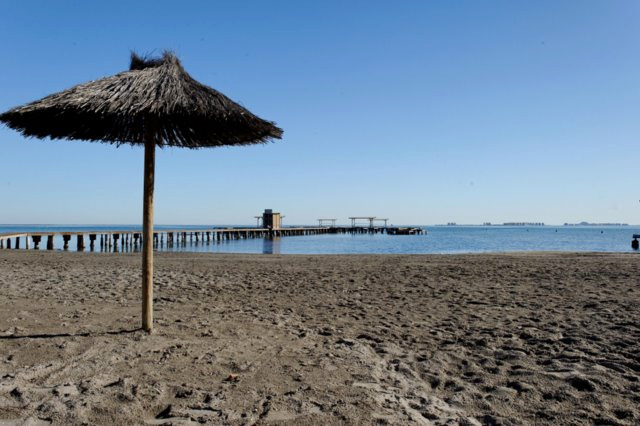 One Blue Flag and five Q for Quality beaches in San Javier The Blue Flag for beach tourism quality is an internationally recognized award given by the Foundation for Environmental Education, who bill the flag as “a world-renowned ecolabel trusted by millions around the globe”. 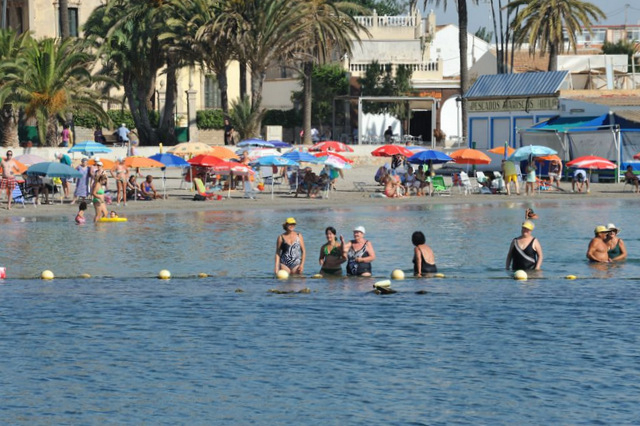 The criteria on which the award of Blue Flag status is based are grouped together in four areas, dealing in general terms with water quality, environmental information..
An attractive stretch of sand on the Mar Menor in Santiago de la Ribera Playa El Pescador is one of the urban beaches in Santiago de la Ribera, on the Mar Menor coastline in the municipality of San Javier, and lies between the Playa de Colón and Playa Barnuevo. 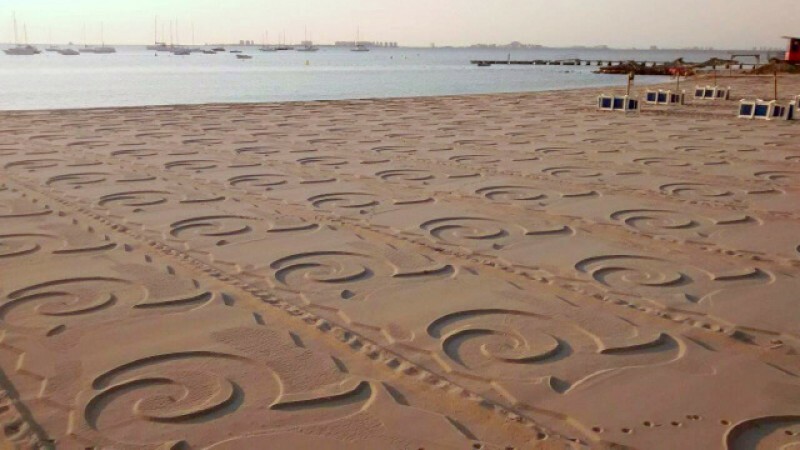 It's an attractive urban beach, 280 metres long with an average width of 20 metres, and the sand is fine, soft and groomed. There is lower occupancy than at some of the others.. 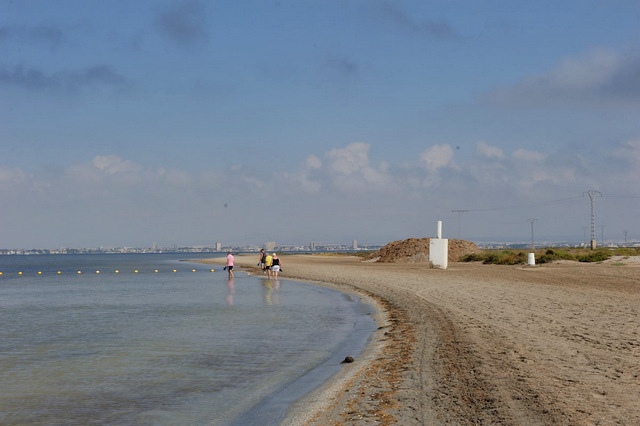 The northern tip of La Manga del Mar Menor This area of land is as far north as it's possible to go in La Manga del Mar Menor before the land disintegrates into a series of wetlands which ultimately meet the salinas, or salt pans, of San Pedro del Pinatar. 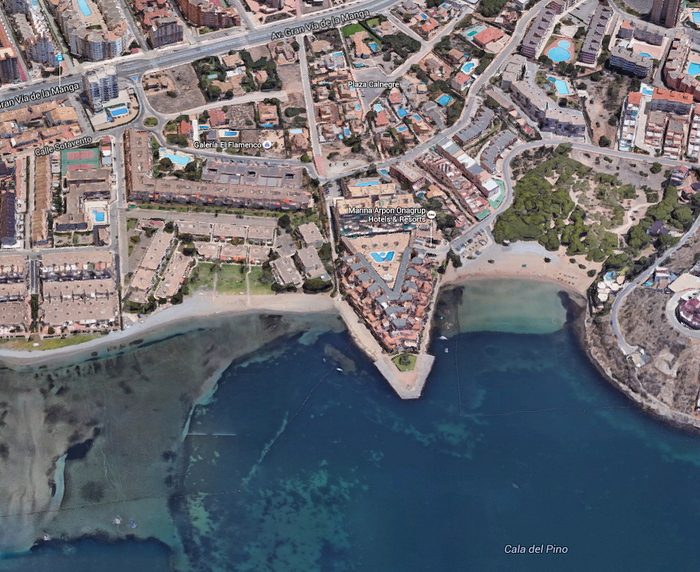 Residential development also comes to an end here with the Urbanización Veneziola, and what was intended as a major leisure complex remains only semi-developed, but it is a very interesting..
1.5 kilometres of sandy beach at the northern end of La Manga del Mar Menor The Playa la Veneziola is close to the northern end of La Manga del Mar Menor, and services the residential development of the same name kilometres 18.6 and 16.4. 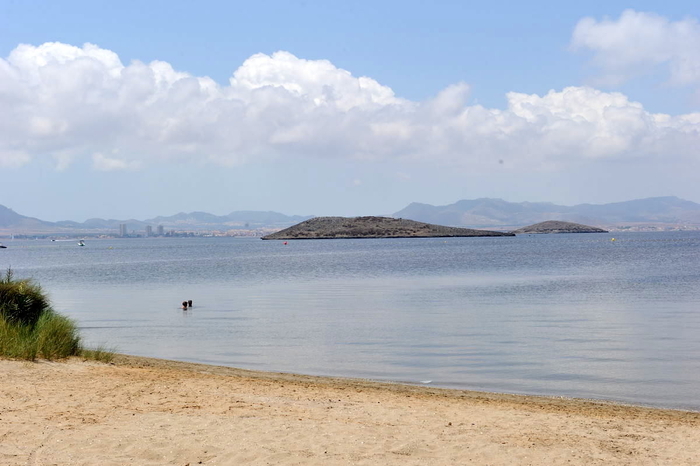 This is a long, thin natural beach, 1.5 kilometres long but only 10 metres wide on average, lying on the Mar Menor side of the spit. 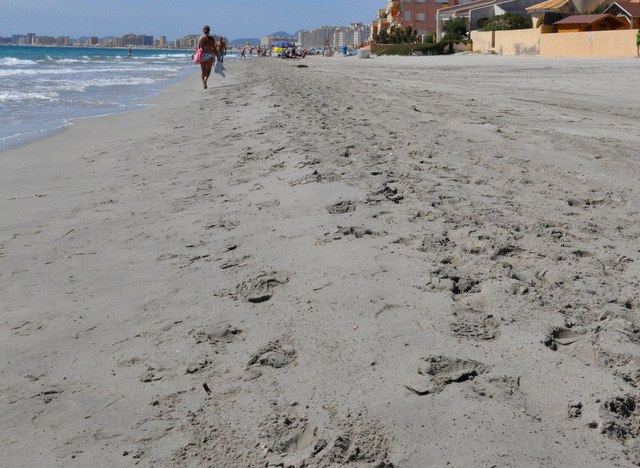 The sand is coarse, but the beach falls within the programme of maintained..
1,500 metres of Mediterranean beach at the northern end of La Manga Playa del Pudrmiel is close to the northern end of La Manga del Mar Menor, and services the Aldeas de Taray and Las Góndolas residential areas between kilometres 17.2 and 16.3. 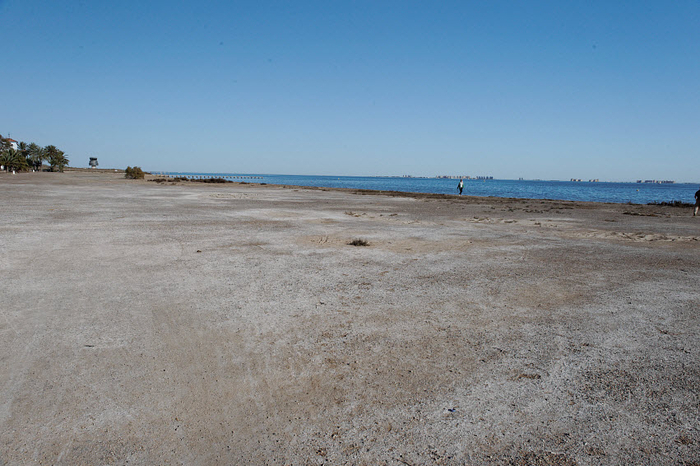 At 1,500 metres it is a long natural beach, and at an average of 18 metres wide it is one of the largest in the area. 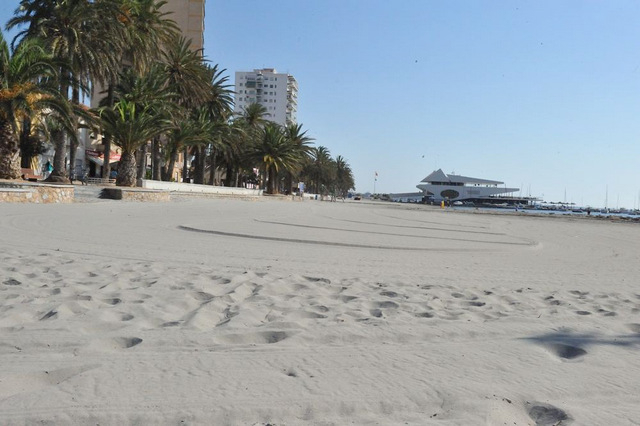 The sand is naturally fine and greyish, and makes it a very attractive ..
A vast 2.6 kilometre long, low density beach between kilometres 16.3 and 13.9 of La Manga del Mar Menor Playa Ensenada del Esparto This is a vast semi-urban beach which runs down a fairly low density area of La Manga del Mar Menor at the far end of “La Manga Strip” as it is frequently referred to by holidaymakers and services the urbanisations between kilometres 16.3 and 13.9. 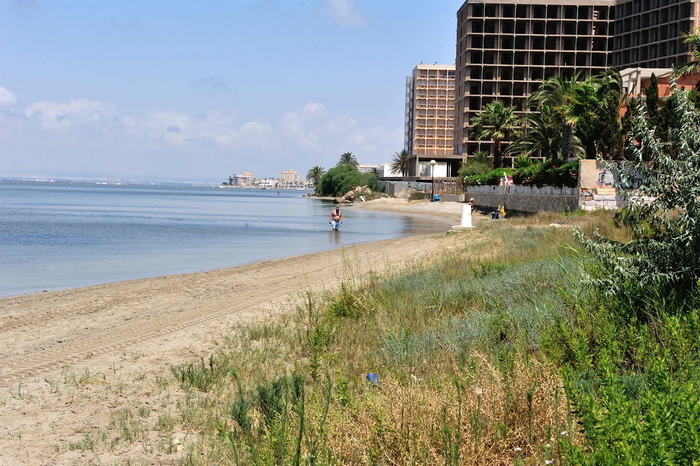 It’s so huge that density can be nothing other than..
A long sandy Mar Menor beach on the Mar Menor coast of La Manga Playa Chica is a long, thin Mar Menor beach, located towards the northern end of La Manga del Mar Menor between kilometre 16.4 and km 14.6, and although it’s 1.8 kilometres long the average width is just 10 metres. As a result, occupation is higher at the points near services and main built-up areas, and low in the patches where there is less construction. This area is fairly.. 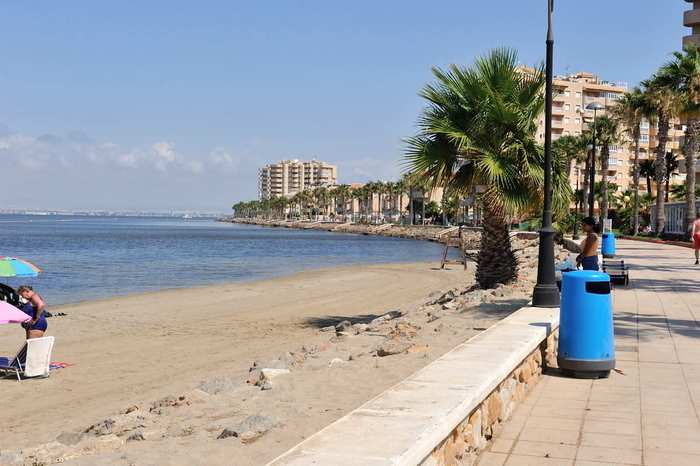 This Q for Quality beach lies in the San Javier end of La Manga del Mar Menor Playa Mistral is one of the most busiest La Manga del Mar Menor beaches, occupying an attractive proposition in a densely populated area close to the Tomás Maestre sporting port and the ferry linking La Manga del Mar Menor to Santiago de la Ribera. 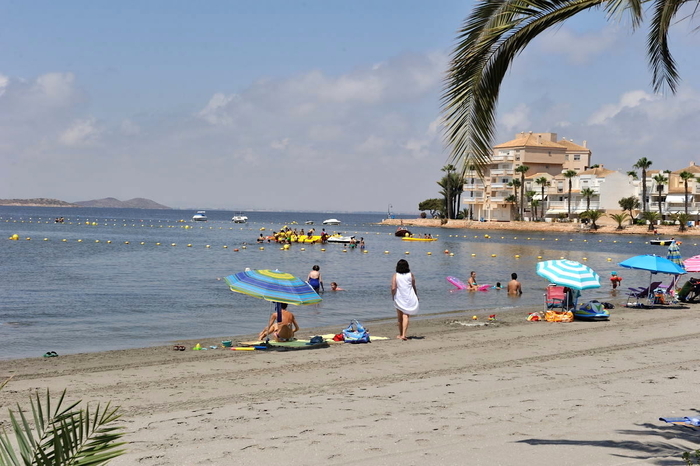 The beach lies on the Mar Menor side of La Manga and is consistently awarded Q for Quality flag in recognition of the..
A 2.9-kilometre stretch of sand on the Mediterranean coast of La Manga Playa Estacio is a 2,900-metre-long semi-urban beach with an average width of 18 metres and fine, golden sand, typical of the vast beaches along the Mediterranean coastline of La Manga del Mar Menor. 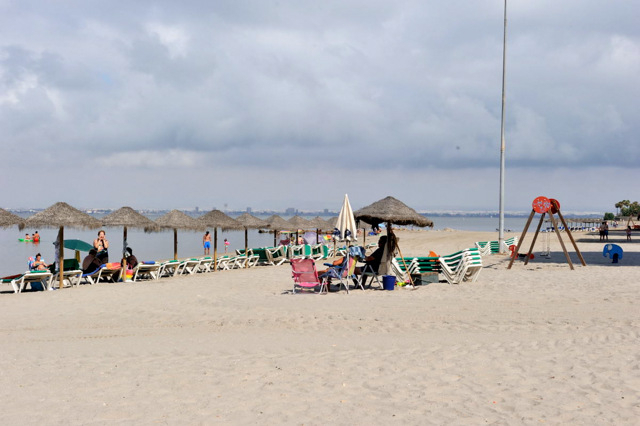 Occupancy is generally low to medium as this part of La Manga is long fairly slender, reducing the local population, although the beach is also next to the Tomás Maestre..
A long but little-used Mar Menor beach in La Manga Playa Matagordas is a long, thin Mar Menor beach which runs for a distance of 3.3 kilometres between kilometres 12.2 and 8.9 of La Manga del Mar Menor. 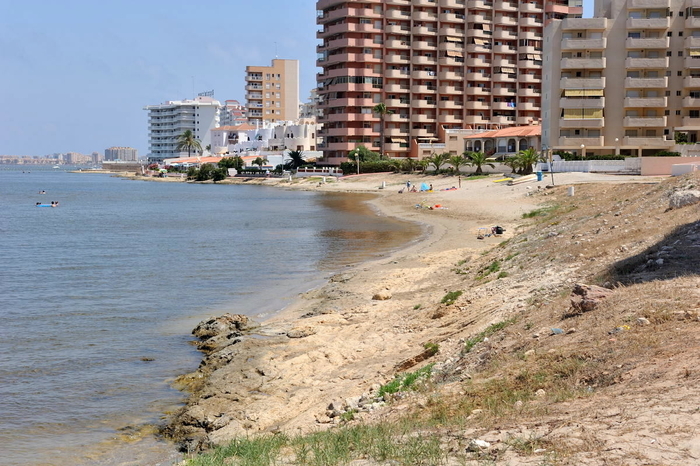 In this section the road runs very close to the Mar Menor coastline as the beaches on the Mediterranean side of the spit are wider and the strip of land itself is very narrow. 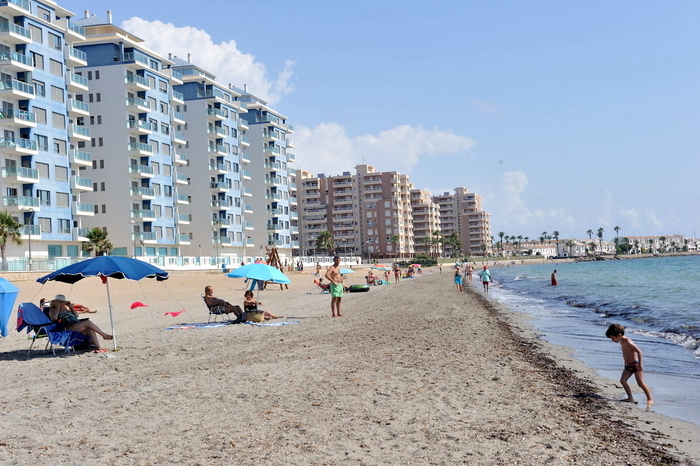 Building is fairly dense, so the beach undulates in and out..
1.8 kilometres of broad, sandy Mediterranean beach in La Manga Playa El Arenal is a long Mediterranean coastal beach in La Manga del Mar Menor, offering 1.8 kilometres of unbroken sand, and averaging 18 metres in width. 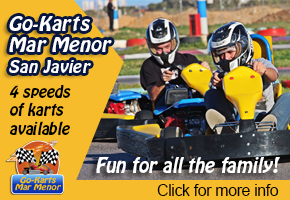 It runs between kilometres 8 and 10 of La Manga, in an area where the land widens out sufficiently to permit the construction of substantial blocks of residential apartments on both sides, although mainly on the Mar Menor..
A 450-metre-long Mar Menor beach half way along La Manga Playa las Antillas is a Mar Menor beach located within a curving bay between two rocky headlands known as Punta del Pedrucho and Punta Pedruchillo. 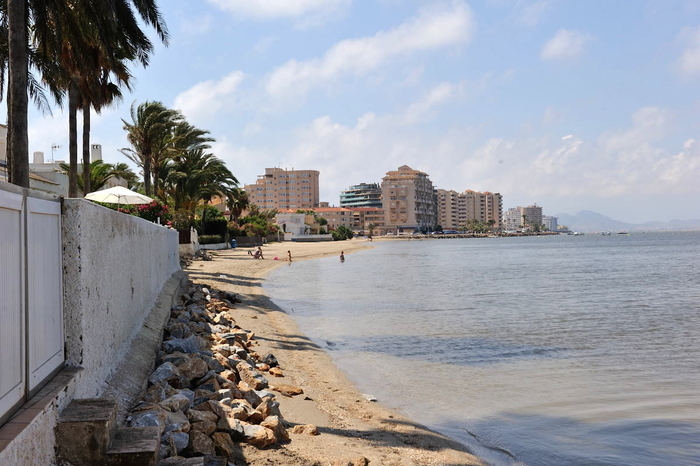 This area lies between kilometres 8.9 and 8.5 of La Manga del Mar Menor and is heavily developed, with apartment blocks on both sides of the Gran Via which runs the length of the strip. 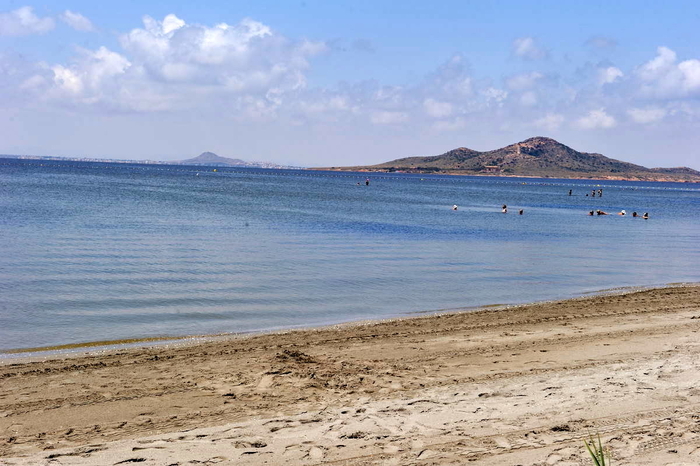 The beach itself is 450 metres long and averages..
A 500-metre stretch of sand on the shore of the Mar Menor Playa El Pedruchillo occupies a sweeping curve just south of Punta el Pedruchillo, a rocky outcrop looking out towards Isla Grosa, about half way along La Manga del Menor between kilometre 8 and 8.5. 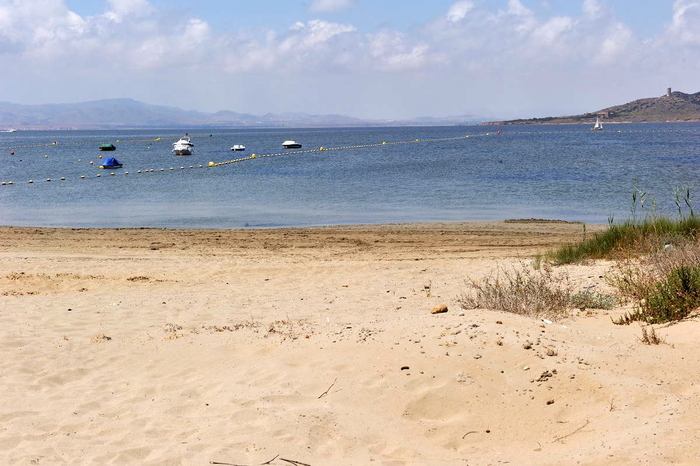 This is a Mar Menor beach, and has natural, coarse sand, and good facilities. 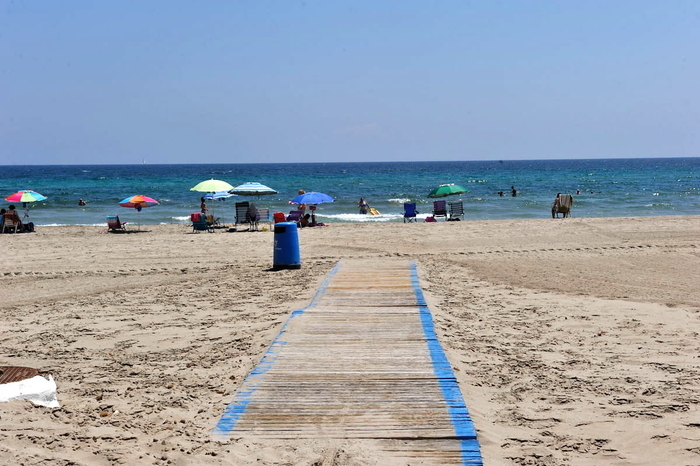 It’s half a kilometre long and 10 metres wide, and is classified as a high occupancy beach during..
3 kilometres of open, sandy Mediterranean beach in La Manga Playa Pedrucho is a vast Mediterranean coastal beach, offering 3 kilometres of unbroken sand, and averaging 18 metres in width, and should not be confused with Playa de Pedruchillo, which lies on the other side of La Manga on the shore of the Mar Menor. 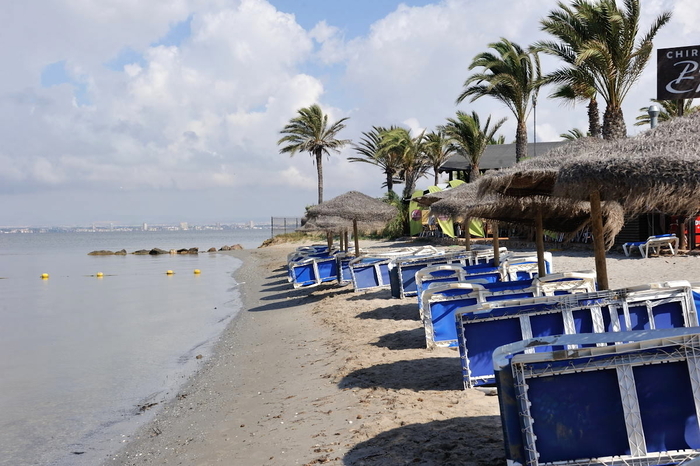 The beach runs between kilometres 4.9 and 7.9 of La Manga in an area where the spit of land widens out sufficiently to have allowed..
900 metres of Mar Menor beach in the central part of La Manga Playa de Poniente runs between kilometres 7.2 and 8.1 on the Mar Menor side of La Manga in an area where the land has widened out sufficiently to permit the construction of substantial blocks of residential apartments on both sides, with the Gran Vía running up the centre of the spit. 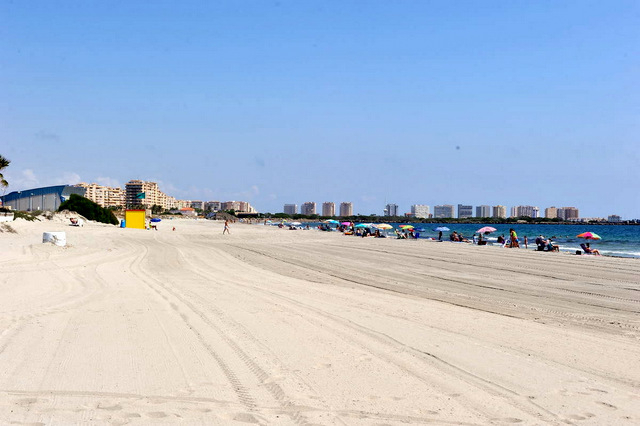 The beach is fine and sandy, and this is a high occupancy urban beach due to the amount of ..
700-metres of well used sandy beach with views towards Isla Grosa Playa el Galán runs between kilometres 7.2 and 6.5 on the Mar Menor side of La Manga in a heavily built area which contributes to its popularlity, as does the fine sand and the attractive view towards Isla Grosa. Nonetheless, this is officially classified as only a medium occupancy beach. ervices and facilities include toilets, footwashes, telephones, beach cleaning, bins..
A 1.7-kilometre-long Mar Menor beach with soft golden sand Playa Lebeche is one of a series of narrow beaches fringing the central area of La Manga on the Mar Menor side and runs for 1,700 meters between kilometres 5 and 6.5 . 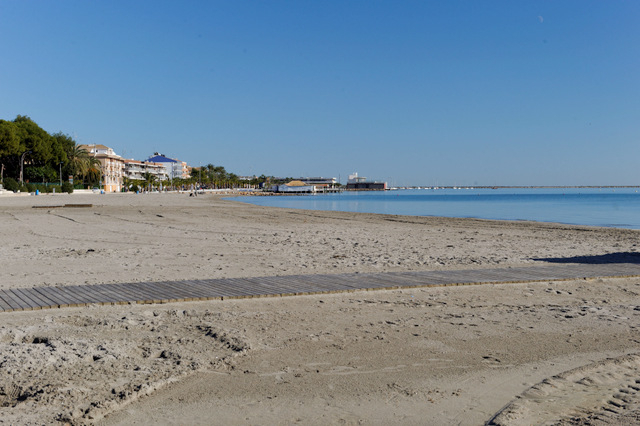 As is typical of many of the Mar Menor beaches in this section of La Manga, it’s narrow, at an average of only 10 metres wide, and as this is a heavily built area of La Manga del Mar Menor with construction on..
A 1400-metre Mediterranean beach with soft golden sand Playa Banco del Tabal is one of a series of glorious wide, open Mediterranean beaches which run down the Mediterranean coastal side of La Manga del Mar Menor, is 1400 meters long and 15 metres wide. 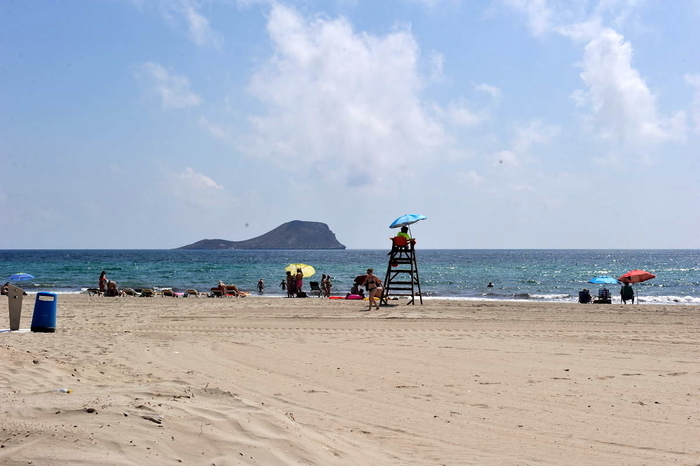 It is the southernmost Mediterranean beach in the municipality of San Javier, since the southern end lf La Manga lies within the municipal boundaries of Cartagena. Banco del Tabal beach..
800 metres of sand between Isla Grosa and the Dos Mares marina in La Manga Playa Alíseos runs between kilometres 4.2 and 5 of La Manga del Mar Menor, in a heavily built area with construction on both sides, and although the sand is relatively coarse is popular among visitors and residents throughout the year. 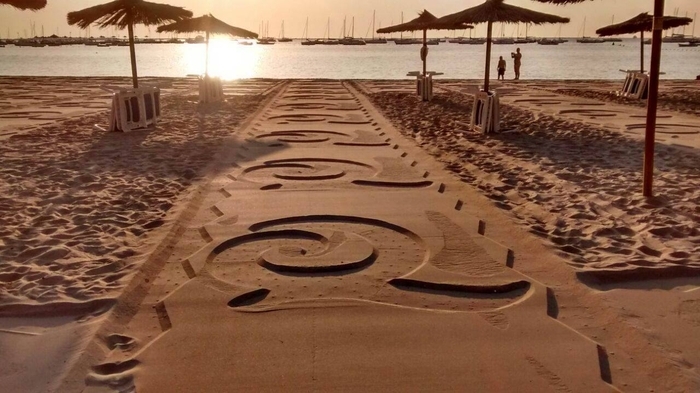 Services and facilities include toilets, footwashes, telephones, drinking water, a children's play area, beach grooming service..
Half a kilometre of sand near the Dos Mares marina in La Manga Playa La Isla runs for half a kilometre along the internal coastline of the Mar Menor and is the sourhernmost La Manga beach in the municipality of San Javier. 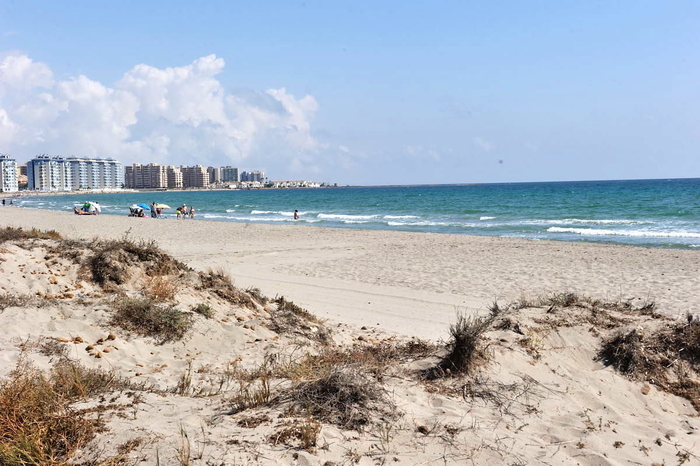 It runs between kilometres 3.7 and 4.2 of La Manga in a heavily developed area, which means that there is hig occupancy, especially, of course, in July and August. Services and facilities include footwashes, telephones..